Unexpectedly to us, Kevin Monce withdrew his lawsuit on October 22, 2008. 22. The statements made by the Deas sisters and published on their web site, aligus.com, libel Kevin M once in that they impeach and harm him in his profession. 3. Defendants lack sufficient information and knowledge to form a belief as to the truth or falsity of the allegations contained in paragraph 3 of the Complaint; therefore, those allegations are denied. 4. Admitted that Nancy G. Deas is a resident of Wake County and that she maintained the web site www.aligus.com. Except as admitted, the allegations contained in paragraph 4 of the Complaint are denied. 6. Defendants lack sufficient information and knowledge to form a belief as to the truth or falsity of the allegations contained in paragraph 6 of the Complaint; therefore, those allegations are denied. 7. Defendants lack sufficient information and knowledge to form a belief as to the truth or falsity of the allegations contained in paragraph 7 of the Complaint; therefore, those allegations are denied. 8. Defendants lack sufficient information and knowledge to form a belief as to the truth or falsity of the allegations contained in paragraph 8 of the Complaint; therefore, those allegations are denied. 9. Defendants lack sufficient information and knowledge to form a belief as to the truth or falsity of the allegations contained in paragraph 9 of the Complaint; therefore, those allegations are denied. 10. Admitted that Nancy Deas created, maintained and wrote for the web site www.aligus.com. Except as admitted, the allegations contained in paragraph 10 of the Complaint are denied. 11. 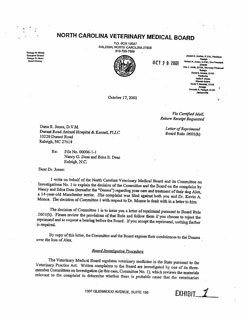 Admitted that in 2000 Nancy Deas and Edna Deas filed Complaint 00006-1-1 with the Veterinary Medical Board against Dr. Dana Jones and the plaintiff alleging a variety of acts of negligence and malpractice. Except as admitted, the allegations contained in paragraph 11 of the Complaint are denied. 12. Admitted. 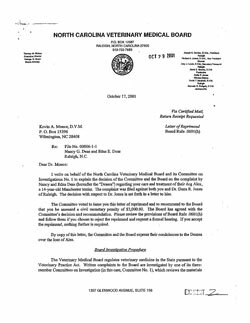 A copy of the reprimand issued by the North Carolina Veterinary Board to Dr. Dana Jones is attached as Exhibit 1. 13. Admitted that the Veterinary Medical Board issued a letter of reprimand against Dr. Monce, that Dr. Monce contested the reprimand, and that the Veterinary Medical Board initiated a contested case in the Office of Administrative Hearings. A copy of the reprimand issued by the North Carolina Veterinary Board to plaintiff is attached as Exhibit 2. 14. Admitted that a Consent Order was entered on April 2003. A copy of the Consent Order, which speaks for itself, is attached as Exhibit 3. Except as admitted, the allegations contained in paragraph 14 of the Complaint are denied. 15. Admitted that the language quoted in paragraph 15 of the Complaint about which plaintiff complains was published on the web site www.aligus.com in November, 2002 and remained there continuously and without material alteration from the date of its first publication until after the date of the plaintiff's complaint. 16. 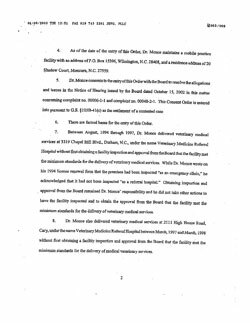 Admitted that the language quoted in paragraph 16 of the Complaint about which plaintiff complains was published on the web site www.aligus.com between December 15, 2002 and February 14, 2003, and remained there continuously and without material alteration from the date of its first publication until after the date of the plaintiff's complaint. 17. 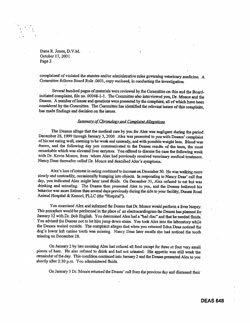 Admitted that the document attached to plaintiff's Complaint as Exhibit A appears to be a portion of the home page for the web site www.aligus.com. Except as admitted, the allegations contained in paragraph 17 of the Complaint are denied. 18. Admitted that the defendants are of opinion that the plaintiff acted negligently and incompetently, and thus committed malpractice, in connection with the treatment of their dog. Except as admitted herein, paragraph 18 is denied. 21. Defendants repeat and incorporate by reference their responses to paragraphs 1 through 20 of the Complaint. Plaintiff's claims are barred by the applicable statute of limitations. 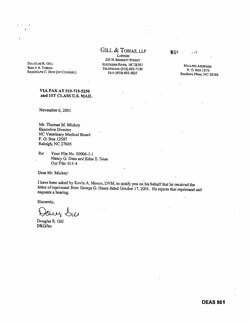 Plaintiff's claims are barred because the information about the plaintiff published on the web site www.aligus.com, when considered in its entirely and in proper context, is not defamatory as to the plaintiff. Plaintiff's claims are barred by the doctrines of waiver and estoppel. The material concerning the plaintiff published on the web site www.aligus.com is protected under, and plaintiff's claims are barred by, the First and Fourteenth Amendments to the Constitution of the United States, and Article I, Section 14 of the North Carolina Constitution (1971). The factual information about the plaintiff published on the web site www.aligus.com is privileged because it constitutes fair and neutral reportage concerning matters of general public interest and concern, and was published in good faith and without actual malice. 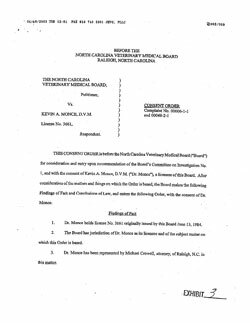 To the extent any of the allegedly defamatory statements by these defendants were made in communication to, or at hearings or meetings conducted by, the North Carolina Veterinary Medical Board, the plaintiff's defamation claim as to those statements is barred by an absolute privilege that these defendants had in connection in making these statements. Certain statements complained of by the plaintiff are statements of opinion protected by the First and Fourteenth Amendments to the Constitution of the United States, and Article 1, Section 14 of the North Carolina Constitution (1971), and thus are not actionable against these defendants. The plaintiff's claim for punitive damages against these defendants is barred as a matter of law because plaintiff has not alleged, and in good faith cannot allege, that the defendants acted with actual malice in publishing the information about which the plaintiff complains. An award for punitive damages to the plaintiff would be unconstitutional because it would constitute a denial of due process and a penalty in violation of the Fifth and Fourteenth Amendments of the United States Constitution. The material concerning the plaintiff published on the web site www.aligus.com was published in good faith and without malice, pursuant to a proper interest or duty, was limited in scope to that interest or duty, was made on a proper occasion was made to proper parties. The plaintiff's complaint is not well grounded in fact and is not warranted by existing law or a good faith argument for the extension, modification o reversal of existing law. This the 3rd day of October, 2005. Nancy G. Deas, being first duly sworn, deposes and says that she is the defendant in the foregoing Amended Answer, that she has read the Amended Answer, and that the contents thereof are true to her own knowledge, except as to matters stated on information and belief, and as to those matters she believes them to be true. Edna E. Deas, being first duly sworn, deposes and says that she is the defendant in the foregoing Amended Answer, that she has read the Amended Answer, and that the contents thereof are true to her own knowledge, except as to matters stated on information and belief, and as to those matters she believes them to be true. View the full exhibit as pages 11-18 of the PDF. View the full exhibit as pages 19-25 of the PDF. View the full exhibit as pages 25-33 of the PDF.